After tearing up the stage at Wireless over the weekend along with Justin Timberlake, Nas, A Tribe Called Quest and more. 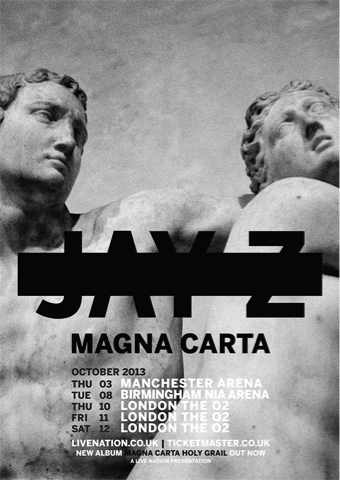 Jay-Z has announced European tour dates for his his new album ‘Magna Carta Holy Grail’. ‘Magna Carta’ reached #1 on the charts in the UK and has actually been getting amazing feedback since its release last week. It seems as if the UK is falling in love with Hov and vice versa. Mr Carter will be kicking off his European tour in the UK starting with Manchester Arena, then he'll be having three back to back nights in London's O2 Arena. He'll also be making his way over to France, Switzerland, Belgium, Sweden, Norway, Germany and more European countries throughout the month of October. Check out the UK tour dates below as well as the European ones. Pre-sale tickets for the Jay-Z tour will be out this coming Thursday - 18 July via Live Nation, from 9am. Tickets will be available to the general public on Friday 19 July from 9am!